Sgt.Maj. Alexander Bird of the 154th New York Infantry, the subject of one of the articles in this issue of Military Images, is shown with his wife, Melissa, in an albumen photograph. The editor suggests that readers in favor of preserving Civil War battlefields subscribe to The CWRT Digest, so that other battlefields do not fall to the same fate as Chantilly in Virginia. The letters to the editor begins with a lengthy letter about the “off-beat” images found in the previous issue’s “Stragglers.” The author explains how carte de visite images can be manipulated with the original image switched with another in order to preserve a good backing. He suggests looking at other images from the same photographer to see if there is similarity with backdrops or even wall moldings or other features to authenticate a questionable image. Another letter provides additional information on the fate of Corporal Warren Alger (also in the previous issue); the author of this letter has access to a diary of another soldier who mentioned his sudden death. Other letters include the answer to Pop Quiz #320, which was an Italian Rifle Guards unit from Manhattan’Little Italy in the 1920s. Six different publications are offered for review, beginning with the reprinting of the Recollections of a Naval Officer by Captain William H. Parker, which tells his story from joining the U.S. Navy at the age of 15, to his anguished decision to join the Confederacy, to several important naval battles, to his accompanying the refugee Confederate leadership from Richmond at the end of the war. Next is Confederate Shipbuilding by William N. Still, Jr. This book describes the failed attempt of the Confederacy to build a navy. The editor notes that readers interested in Still’s book should look also at “Phantom Fleet: The Confederacy’s Unclaimed European Warships” by David Sullivan in Warship International (vol. XXIV, no. 1). Third in review is Historic Dress of the Old West by Ernest Lisle Reedstrom, which is divided into different chapters devoted to different aspects of Western life. The review notes that there are numerous errors in the book that limits its value, however readers of MI might be interested in the nicely written overview of the life of frontier soldiers. Next is the review of Embattled Courage: The Experience of Combat in the American Civil War by Gerald F. Linderman. This volume describes the transition of the concept of “courage” between civilians and soldiers; the civilians maintained their definition without change, while the soldier, who was living the reality of war, changed his definition. Linderman posits that the divergence in definition remained until several years after the war, when the memories of the soldiers who survived softened over time and returned to an accord with the civilian definition. World Bayonets 1800 to the Present: An Illustrated Reference Guide For Collectors by Anthony Carter is next, and though the title is a bit misleading (only British bayonets are covered with American and other nations’ bayonets starting in 1873), it may be of use as there are very few books like this that focus on bayonets. Last in review is Uniforms of the French Foreign Legion by Martin Windrow which not only presents the uniforms of the French Foreign Legion over time, but also tells the stories of many Legion groups, including the one which fought to maintain Maximillian of Austria on the Mexican throne in the early 1860s. The U.S. Navy warrant officer is a rank dating back to 1794, unlike the warrant officer in the U.S. Army, which is a creation of the twentieth century. The men who held these ranks had various titles, such as passed midshipmen, sailmakers, and many others. The article describes the uniform details for the rank of warrant officer, often indicated by the number of buttons or the cap badges, and provides six different images as illustration. A sixth-plate tintype shows six men appearing to be at work at tailors, or are they? Various items used in tailoring are prominently displayed, but with two soldiers in the image and a feel of relaxation among the men makes it a curious image indeed. The author requests any further information from the readership that might give the image more context and meaning. The three collectors who submitted these images provide a glimpse into childhood. The first two pages are from the collections of William Schultz and Michael Scharfman, offering eight images of children in patriotic garb, including miniature uniforms of varying types. The eight images on the second pair of pages are from the collection of Robert Kotchian; they are gem-sized tintype images found in an album which dates from the time of the Civil War. Each of the boys wears a kepi with the initials “N.A.C.” on them, presumably identifying them as Newark Academy Cadets. The images range from the serious boy saluting the camera to the mischievous lad who is thumbing his nose! Additional information regarding these images is encouraged as well. The sixth-plate ambrotype of Col. Van Manning and his wife Mary Zilephro Wallace Manning does not tell the story of the commander of the only Arkansas unit to fight with the Army of Northern Virginia. One would hardly note that the young lawyer who had gathered the men known as the “Arkansas Travellers” temporarily led a Texas brigade through the terrible fighting at Sharpsburg and was seriously wounded. Joined as part of the Texas Brigade, Manning fought on Houck’s Ridge during the second day of fighting at Gettysburg and led his Arkansans on a desperate charge, which left him wounded once more as a shell exploded right into his face. He led men at Chickamauga, Longstreet’s Knoxville campaign, and then returned to Virginia to fight in the Wilderness. Here he was wounded once more, and captured. He was hospitalized and then in August 1864, he led other men in the capture of the ship transferring him and 600 other prisoners – “The Immortal 600” – but the effort failed, and Col. Manning was imprisoned under close quarters. Again he annoyed his Federal captors by encouraging his fellow captives to refuse to sign the Oath of Allegiance, even after Lee surrendered; Manning would cut off the buttons from the uniforms of the “traitors” who did sign. Finally released in July 1865, Manning did have a successful post-war career as a lawyer and U.S. Congressman. Thirteen different outdoor images are featured in this article, which gives the reader some unique glimpses into the life of a Civil War soldier, from the quarter-plate tintype of soldiers in the process of breaking down their camp, to another quarter-plate tintype of what appears to be a new unit at training camp, to a sixth-plate tintype of Yankee troops with their camp set up in a town. Some of the images are portraits taken in outdoor settings, while one of the collection includes no images of humans at all – just the view of a camp with campfires burning and horses tied out in the woods. One intriguing image is of several Federal artillerymen relaxing with two small black boys in kepis in the front of the group and an unknown house on a hill in the background. The uniform worn by the 14th Brooklyn is truly a different one than those normally worn by Federal soldiers during the Civil War. It is distinguished by its chasseur leggings, red trousers, and a blue jacket with inversed red chevrons at the bottom of the sleeves and Russian knots on the shoulders. The jacket is unique also in that it had “false vest panels” down the front; the jacket was button closed at what looked like a vest, while the two false panels with as many bright brass buttons appeared to be the open jacket. The waist belt finished the look. The authors trace the service of Alexander “Alec” Bird after his enlistment as corporal in Company G of the 154th New York Volunteers in the summer of 1962. He was a blacksmith and farmer, and had recently married Melissa Ada Hyde, with whom he is featured on the cover of this MI issue. His diaries indicate that there were six images taken of himself during the course of the war, however the authors of the article have only located three at the time of this publication. The article includes one taken as a lieutenant in Savannah, Georgia on December 31, 1864 and a carte de visite taken at the time of his mustering out in June 1965 in Elmira, New York. He was in the fighting at Chancellorsville, where he also contracted the typhoid fever that kept him from joining his unit during the first day’s fighting at Gettysburg. Alec also took part in Sherman’s “March to the Sea” as well as doing duty in New York encouraging enlistments. 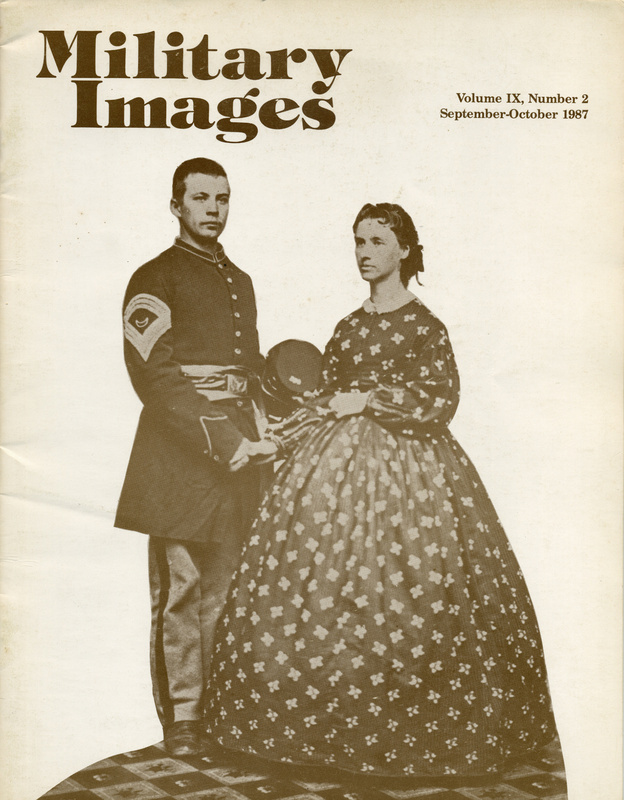 This issue’s “Stragglers” include an unpublished carte de visite image of General Philip Kearney along with a quarter-plate tintype of an unidentified soldier with the knees of the next to be photographed in the margins of the image. There are three different sketches made of the charge of the 6th Michigan cavalry at Falling Water on July 14, 1863; two are by Edwin Forbes for Harper’s Weekly and one is by famed combat illustrator Alfred R. Waud. One fortunate collector found two images of the same soldier, one in dress and undress uniforms, at two different places. Lastly, Pop Quiz #322 shows former Confederate Brigadier General Alexander Welch Reynolds in 1869, wearing his uniform of colonel in the Egyptian Army. A quarter-plate tintype features three cavalrymen, complete with Gallagher carbines.